It can be tempting to blow the bank account on your precious pea. We get it: they’re adorable, and everything that they wear and play with is also adorable. Who doesn’t want the best that money can buy when it comes to baby? The good news is, there are plenty of great, quality toys out there that baby is bound to love, and that won’t put a strain on the monthly budget. Below, we’ve brought you the best of cheap baby toys. The price is low but you can set your expectations high with these top-rated products! Each of the toys on this list has been reviewed. They each meet the criteria of our website and are the best toys for babies for parents on a budget. The products are all developmental appropriate for babies and have been tested for safety. 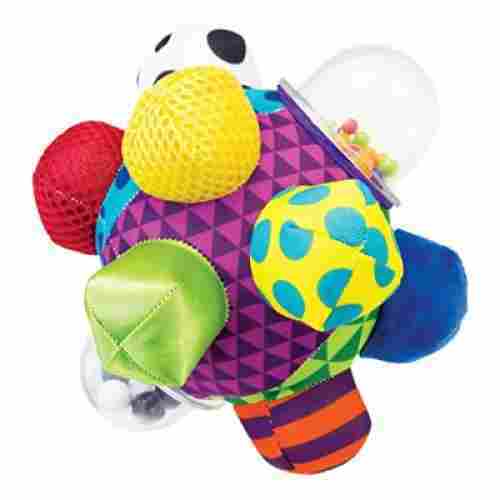 Shake, rattle, and roll with the Sassy Developmental Bumpy Ball. This fun, colorful baby to is full of various sounds, shapes, and textures to keep your little one stimulated and cooing happily through play-time. 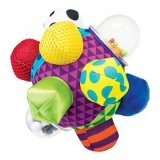 The chunky bumps are easy to grasp and encourage baby to work their motor skills and hand-eye coordination as they grab at the ball and pass it between their little hands. The rattle sounds help to stimulate neural connections in baby’s brain. Though the manufacturer suggests introducing this at six months, several users reported that children as young as two months were able to safely enjoy this ball and benefit from it. Bright and bold and full of a variety of fabrics and materials, this little ball is a fun sensory exploration exercise for baby each and every time they pick it up! 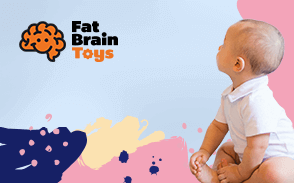 The first 6 months is a crucial time for your little one’s developing brain and this brightly colored and rattling ball is the perfect mind stimulating companion. The different textures also help stimulate their sense of touch, and desire to explore the world around them. This is a toy that can benefit your baby from day one and continue to grow with them as they age. The bright colors help stimulate the eyes of your baby while its soft texture helps strengthen his or her tactile senses. It also provides excellent auditory stimulation. 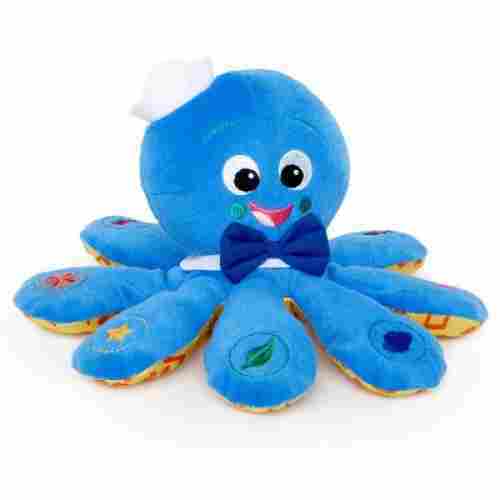 Who would not love the soft blue-and-yellow huggable octopus that is the Octoplush? This baby toy comes complete with soft Baby Einstein melodies in 3 different languages – English, French, and Spanish. The Octoplush’s wide smiling eyes and soft tentacles make for a perfect naptime companion in addition to being your baby’s favorite plaything. The toy is designed to stimulate as many senses of your baby as possible. Studies show that children are more adept at learning new languages than adults and it is never too early to introduce language skills to your baby. This cuddly companion can introduce your little one to simple word concepts in several languages and the soothing classical music is perfect for helping your little one nod off to dreamland. The Octoplush can help stimulate auditory, tactile, and visual perception in your young baby. It is soft enough to be included in your baby’s bedtime essentials. Remember what we said about your baby trying to memorize your face every time you cuddle up to him or her? The same can be said when your baby sees himself or herself in the mirror. With the Floor Mirror from Sassy, you can now make this activity more amusing. This floor mirror can be propped with its back stands. It comes with a ladybug whose body contains a 2-color ball which can be spun. The mirror also has the familiar yellow and black stripes of a bee which your baby can click or rotate. One of the first senses of awe is when a baby first looks in the mirror and recognizes him or herself. This recognition is the building block for the rest of cognition when it comes to spatial awareness and social development. Playing with the tracker ball and bee accessories simply adds to the depth of awareness, in seeing themselves doing different actions. The easel makes for a convenient stand, but having the floor mirror laying flat can be just as beneficial an experience for your crawling infant. 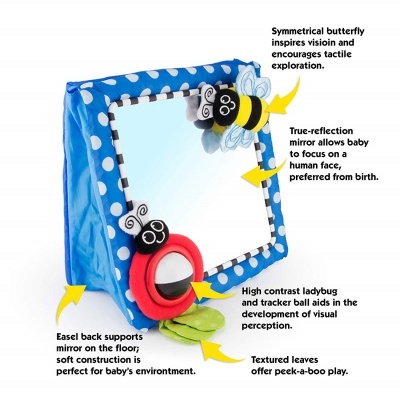 Aside from the fact that the mirror is a unique way of introducing your baby to his or her own looks, the interactive bee and ladybug additions can help further stimulate visual and tactile senses. 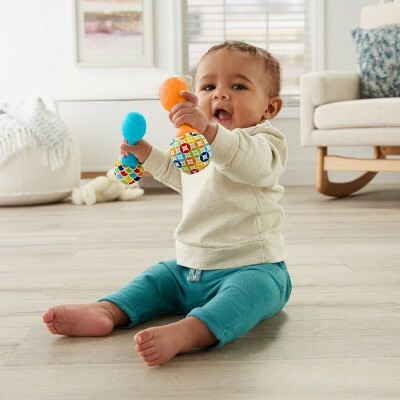 The Winkel Rattle and Sensory Teether Activity Toy is a 2-in-1 baby toy designed to help in your baby’s sensory development as well as getting through the discomforts of teething. 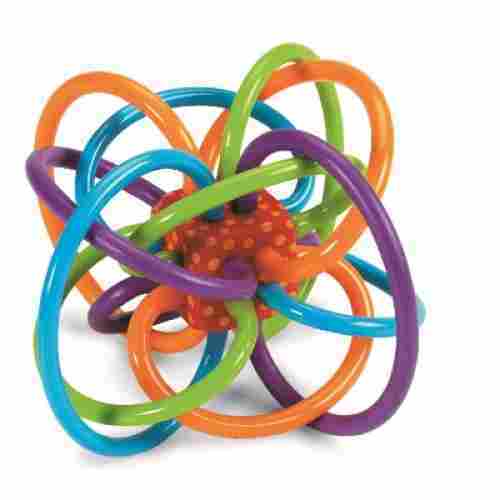 This activity toy is composed of colorful rings that form a maze resembling the structure of an atom with the nucleus or the center being composed of a soft colorful cube. The cube is where little balls are confined to give it its rattling sound effects. Many teething toys can either too boring or too over-the-top! With the toy winkel rattle, the perfect most sophisticated balance is struck! 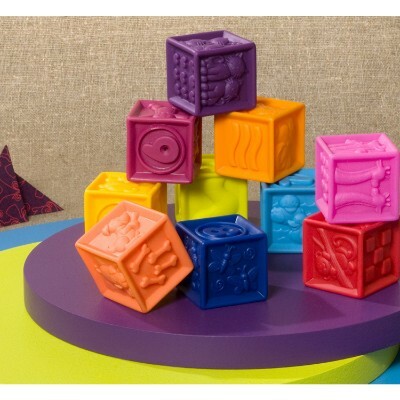 Not only do the teething loops double as handles for developing fine motor skills, central cube begins to form neural pathways that recognizes and recalls geometric patterns. If these things don’t keep your infant endlessly engaged, the rattle effect certainly will. It is the safest and most educational teething toy out there at a super-affordable price! It is small enough to be handled like a ball. It is great for stimulating visual development for younger children and developing fine motor skills for older babies. Babies adore shakers, rattles, coins, bells, and just about anything that can make a sound. 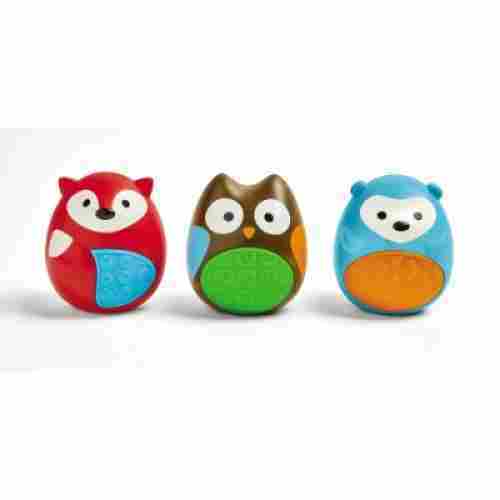 While a lot of the choices our babies would make for their favorite noise-making toy aren’t exactly the safest, the Skip Hop Explore and More Musical Egg Shaker Trio are here to become your little ones newest, noisiest playmates! These forest friends are here to bring some shake, rattle, and roll to playtime! Your child will be able to happily shake the easy to hold Fox, Hedgehog, and Owl toys while they jam away to the unique rattling sounds of each. Composed of all baby-safe materials, there is nothing to fear when these shakers turn into teethers! The textured tummies and backs will also enhance your little one’s developing sense of touch. The adorable little characters can take a licking, literally, and keep on ticking for years to come! These little shakers are the perfect little companions for your baby as they support the development of their eyes, ears, and those perfect little hands. Studies show that music is one of the essential keys to unlocking the full potential of the child’s brain. 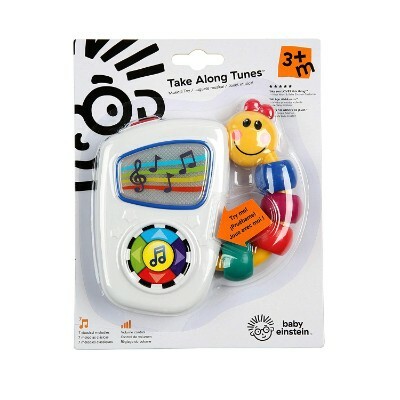 Giving your baby the Take Along Tunes Musical Toy will help stimulate optimum brain development at an early age. 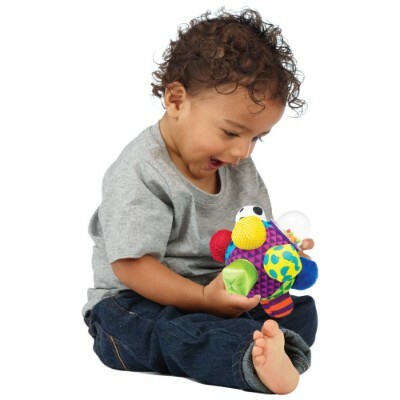 Your baby will be able to conveniently hold the colorful caterpillar body that serves as the toy’s handle. 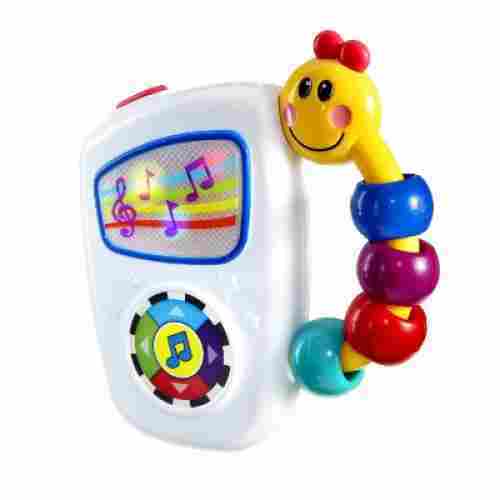 The musical toy comes with 7 classical and baby-friendly melodies that is accompanied by light effects from its colorful LCD. Music supports the earliest stages of language development and there is nothing cuter than watching a baby giggle and coo along to songs! This delightful light up rattle combines two of your child’s favorite things: fun and music, while also helping them edge closer to saying their very first words. The toy can function as your baby’s MP3 player and rattle at the same time. Without the battery, your baby can simply shake the toy to produce the rattle effect. Put in the batteries and your tot may well be on his or her way to becoming the next Mozart. Building blocks play a variety of roles in your child’s development. Giving your baby the Brilliant Basics Baby’s First Blocks will help him or her lay the foundation for creativity, imagination, and problem-solving skills. 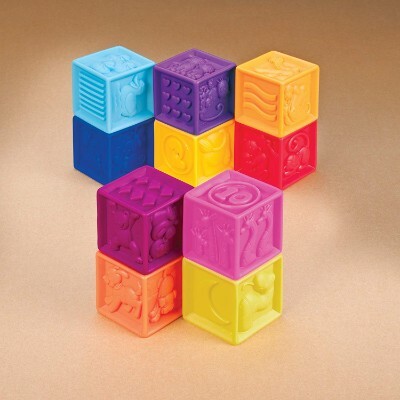 This simple activity cube comes with 10 blocks in 5 different shapes and colors. 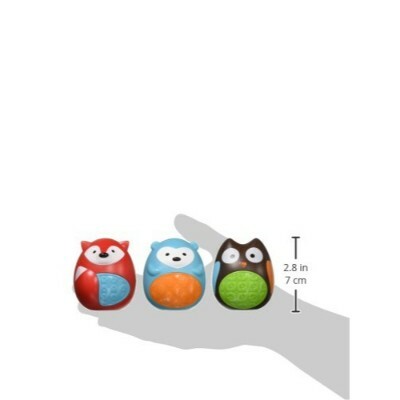 These are stored in a colorful toy box that has a fun animal decal for added visual stimulation. Great set of beginner’s blocks for a baby! 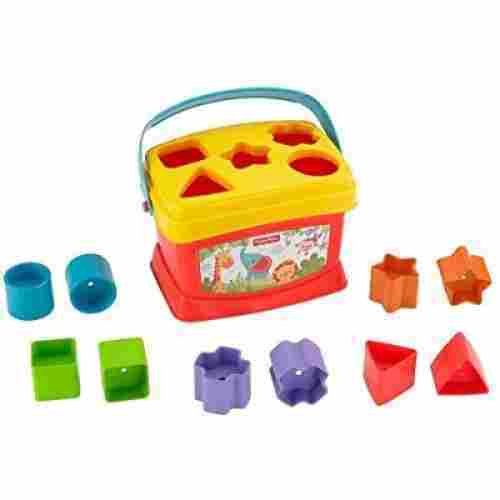 There is the sorting and motor skills element of this set, but another often overlooked aspect is how this has the potential of helping kids learn their geometric shapes! Sure, kids can set themselves on tasks, put the pieces in, dump them out! Fill the matching pieces into the matching slots! But, one crucial thing it can really allow is a greater interaction with parent and child. A parent can easily pick out any shape, say the name of, and the color, then wait for a moment of comprehension. The toy is perfect for introducing the concept of colors and shapes to your young baby. 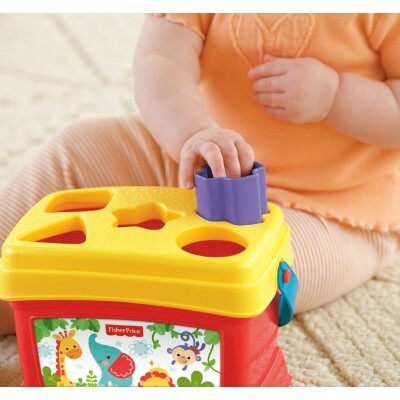 For older infants, they may benefit from its shape sorter functionality while at the same time reinforcing the development of spatial intelligence, hand-eye coordination, and fine motor skills. 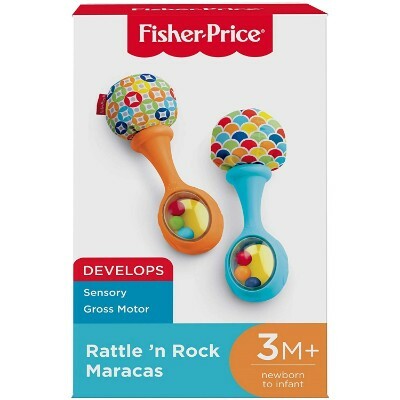 Get your little one rockin’ and rattlin’ with these darling Fisher-Price Maracas. Each set includes two maracas, sized perfectly to fit tiny hands so they can grasp and shake the night away. The colorful beads inside provide visual stimulus to children, while also making a run rattling noise when shaken. Colorful pom poms decorate these rattles and are super soft to the touch. All that grabbing and shaking produces strengthened motor skills--and also some fun beats! Dance along to get your baby playing and help them begin to understand cause-and-effect. Turn on the radio to baby’s favorite song, and make a party out of it! These maracas allow baby to work their gross motor skills. The grasping and shaking also helps to improve hand-eye coordination, and to establish the basic premise of cause and effect through sound and movement. Little ones will love the vibrant colors and soft textures as well, helping to stimulate those active baby brains. These are cute little noise-makers that aren’t too loud or obnoxious. Baby might need a few months to grow into them, but around 6-8 months this will probably quickly become a favorite. Babies learn best using their senses. However, it is also crucial to have a toy that your baby can use even when he or she is already a toddler. That is the aim of the B. One Two Squeeze Blocks. 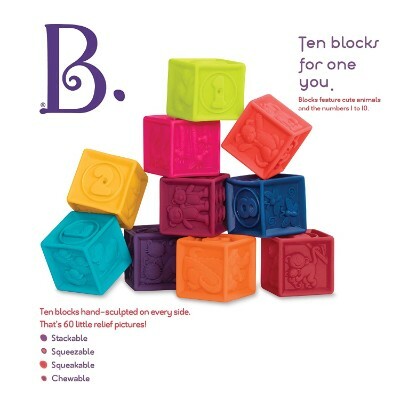 The set comes with 10 colorful, hand-sculpted, blocks that can be stacked, floated, and squeezed. 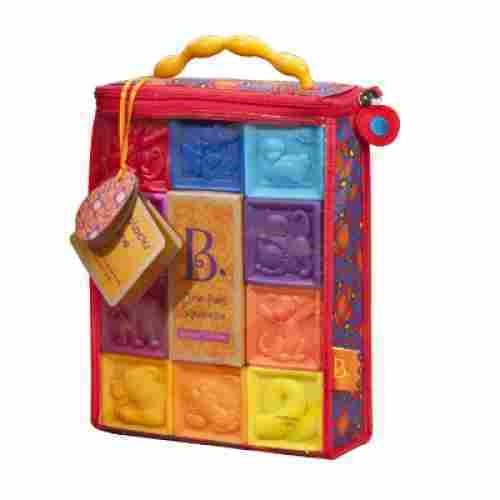 Each block has reliefs of an animal figure and a number to aid in your baby’s learning. The blocks are soft and squeezable and are made of safe materials so your baby can even chew on them. Let’s face it, just about any toy you purchase for your baby is going to end up in their mouth. So when you find a toy that is designed to be safely chewed as well as intellectually stimulating it’s not surprising that you might see Wile E. Coyote-esque dollar signs light up in your eyes! These blocks give your baby’s brain a boost while still getting the biggest bang for your buck! The animal and number relief on the blocks make for excellent tactile stimulation while the bright colors can help in visual development. The toy is soft and can be played with in your baby’s crib, playpen, or even the bathtub. It’s a bird, it’s a plane….no, it’s definitely a bird! A whole box of birds! 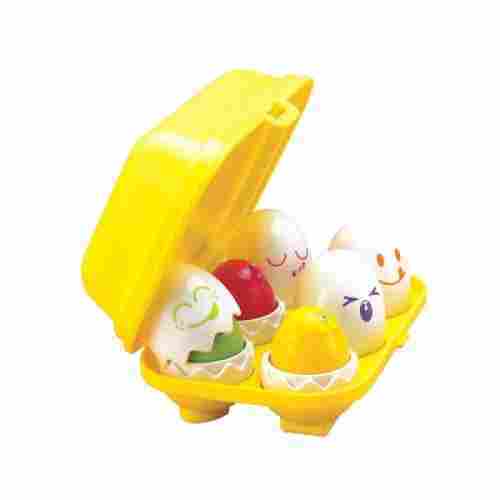 Your little one will burst with delight at Toomies Hide & Squeak Eggs. This adorable infant toy features two unique ways to play by pairing the colorful chicks with their matching colored faces. Each egg also features a different shape bottom that fits in a specific slot inside the egg carton. It's two matching games in one! Each of the chicks lets out a small "cheep" when gently pressed, making this toy ideal for infants as much as toddlers. When playtime is over, each egg slots back inside the carton and latches for quick and easy clean-up! Your child will have days of fun with this affordable educational toy! Matching games are a great way to help your child build memory skills. Color and shape recognition, as well as early language concepts, abound with this brightly colored toy. 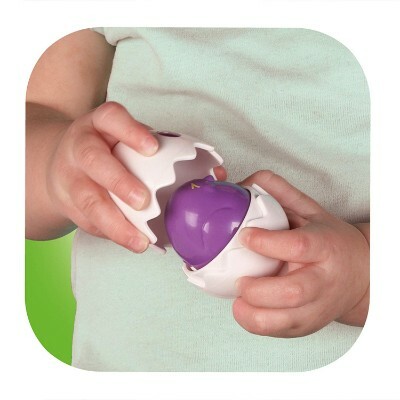 The egg shapes have been specifically designed to be easy for little hands to manipulate, encouraging them to grasp and squeeze which bolsters fine-motor development and builds dexterity. 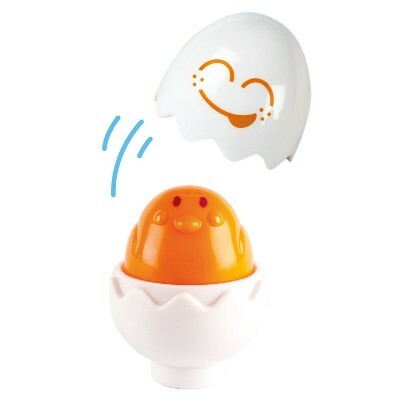 Perfect for individual play or one-on-one time with mom and dad, this adorable egg toy plays as two matching games in one for double the fun! In all of the research, there cannot be an overemphasis on the importance of proper guidance of your child in their formative years! This is typically seen as the period from birth to 7 years of age! With the advance of technology, there are plenty of new toys, gadgets and inventions to choose from that will help. While the blueprint remains the same as far as the neuropathy and development of your child’s brain is concerned, there are so many options out there! Our research has taken into account the life stages of the parents as well when it comes to affordability and time interacting with their children. While the cognitive development brought on by many of these toys is good, parent-child bonding is crucial in complementing this development. We also took into account the mechanics of the toy’s operation and the mirroring stage, leaving the rest of the process to remain organic. Being on a budget doesn't mean you want to--or have to--skimp on the quality of toys for your children! We know how priorities get straightened out pretty fast with young kids! We know how belts need to be tightened and pennies pinched! This is especially the case for young parents just starting out in life with a new family. Naturally, the best investment will always be the time spent with the kids! After that, will be the quality of the toys and activities provided. We give the best offerings in both quality assurance and affordability. Not only does it cover all the bases in building socialization skills, maintaining relevance and enhancing motor skills, it gives the opportunity for deep bonding, modeling and relating to parents in a new and fresh way! Of course, you will not be able to play with your baby 24/7 so you will have to choose the right toy for your baby’s developmental age. This is very important because you want to stimulate the development of the correct skills appropriate for your baby’s age. For example, before you can expect your baby to master fine-motor skills, he or she needs to master his or her gross-motor skills first. Additionally, the very first part of the body that develops is the brain and this progresses towards the limbs. That toys that present colors in a contrasting way help develop and stimulate your baby's vision. As they grow they can explore more colors when they are presented with toys with more contrasting colors. Always make sure that you read all the warning labels on a toy for your baby. Make sure that the toy is age and developmental appropriate before allowing them to play with any type of toy. In choosing your baby’s toys, they does not have to be very expensive. Remember, the key is to provide sensory stimulation especially for very young babies. For older babies, you can start thinking about helping them develop their beginning problem-solving skills, hand-eye coordination, and spatial intelligence. Each of the toys on this list have been researched to ensure that they will stimulate their sensory system and provide the them with the boost in development that all parents are looking for. q: How useful is it to buy a toy that speaks in three different languages? Language is what shapes our understanding of the world! In a way, the more languages we understand, the more hues and colors the world takes on! The point is simply to open the door for your child and spark his or her curiosity. Now, will the Octoplush toy make your child a polyglot savant overnight?! Our course not! But, it will open the neural pathways and set the foundation for a larger view of the world! q: Why should I buy a toy floor mirror when I can just buy a regular one to use with my kid? The Sassy Floor Mirror is probably about the same price or less for what you would pay for a regular mirror at a hardware or home and bath store. That’s one reason. 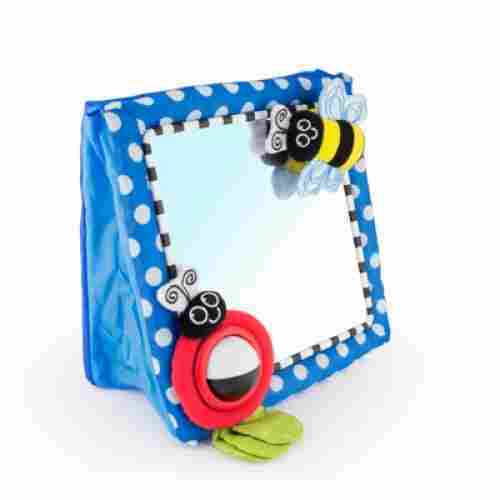 Other reasons could be the uniqueness of this toy mirror which is designed to keep your child more engaged and stimulated, not just with seeing his or her own reflection in the mirror, but also with being able to play with and fidget with some of the side accessories. Even more importantly, they get positive self-awareness from watching themselves as they act out! Also, there are the safety considerations that you won’t have with an ordinary mirror. q: What sets the Winkel Rattle apart from other teething toys? It’s from a 38-year-old company that’s been endorsed by many and won several awards! So, it has the status and the backing to be trusted for quality! I think that one major factor is that this toy doesn’t have any part of it that is unnecessary. Its design is simplistic. It has an intricate atomic shape and everything–its handles or appendages–are purely utilitarian and high-quality. Its minimalist design is what sets it apart, while still managing to stimulate your child, and not break the bank for your budget. q: Should I be concerned about the BPA status for any of these products? With most of these products you don’t have to worry about BPA! They have undergone testing and have been certified BPA-free. We do recommend that all of these toys be used under supervision, specifically for the toys that were not designed to be put in your child’s mouth. Be diligent and do your own thorough research on each item, where it comes from and under what standards it was manufactured. While we can’t keep our child 100 percent free of toxins, we can do our best to keep the margin narrow. q: What are some other ways I can budget around baby’s needs? There are lots of ways to cut back on spending, even with a baby on board! To begin with, consider cost-effective alternative to your essentials. Disposable diapers are definitely less hassle, but cloth ones are significantly cheaper (roughly a quarter of the cost when you factor in accessories and how often you’re changing them). Opt out of expensive diaper changing pads and use a less expensive mat, maybe even one you have on hand already that is waterproof and easy to wipe down. With babies outgrowing their clothing so quickly, opt for a few important staple pieces (t-shirts and pajamas especially) in their current size and wash them often. Newborns are still processing much of the world around them, so there’s no need for fancy toys for a few months. And when you do purchase toys, simple toys such as something to shake (a rattle) and something they can grasp (a soft doll or stuffed animal) are often sufficient enough to still be developmentally beneficial. There are also lots of online groups you can join wherein families give away their old baby items as long as you pay for shipping costs on it. Just make sure you always sterilize toys and other objects that might wind up in baby’s mouth.